Shane McBride of the APSD Transportation Department receives the School Bus Safety Award on behalf of the District at this summer's AAPT banquet in Hot Springs. 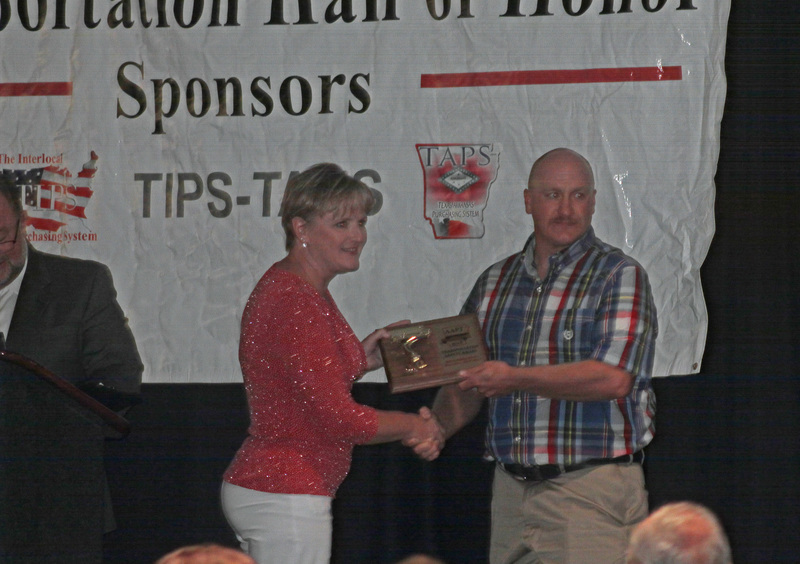 The Arkadelphia Public School District was selected as one of six districts in the state to be awarded the Arkansas Association of Pupil Transportation (AAPT) School Bus Safety Award for the 2017-18 school year at the organization’s annual Hall of Honor Banquet in July. Annual school bus inspections are conducted by state school by inspectors from the Arkansas Division of Public School Academic Facilities and Transportation (DPSAFT) according to specific safety criteria and are intended to ensure that all school buses in operation are maintained at the highest level. The AAPT asks inspectors to nominate school bus fleets in their areas based on four criteria: quality of the school bus inspections, quality of the school bus maintenance records, cleanliness of the school bus fleet and quality of the preventive maintenance program. Based on those criteria, the AAPT named bus fleets from Arkadelphia and five other districts as the safest fleets in the state of Arkansas for the 2017-18 school year. Representing APSD at the banquet to receive the award on the District’s behalf was Shane McBride of the APSD Transportation Department. Arkadelphia’s school buses will be back in action next week as the first day of school for APSD students, faculty and staff in Monday, August 13.